West Coast horn player Richard Todd has "rewritten the book" on French horn playing. Equally adept in jazz and classical repertory, he presents an album that showcases spectacular feats of high register playing, clear articulation, and a strong grasp of jazz improvisation. 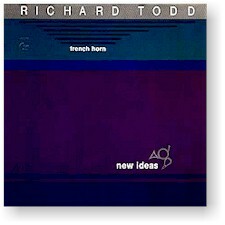 (Also hear more of the jazz side of Richard Todd on Rickter Scale with Billy Childs, John Clayton Jr, and Ralph Penland.) "A remarkable recording. It should be nominated for a Grammy." 2. "What Are You Doing the Rest of Your Life?" Recorded on (A1-5, B3) 27 May 1984 and (B1-2, B5) 28 May 1984 at Jordan Hall in Boston, Massachusetts; (B4) 21 November 1984 at the Sound Chamber in Pasadena, California.